Earlier this year, I expressed skepticism toward The She-Hulk Diaries and Rogue Touch — specifically, about authors scribbling down superhero adventures without the pretty pictures to match and, more importantly, with what seemed like a “romantic” spin (that turned out to be false). I love comics, and removing their visual element would be like neutering them. The physical prowess of female superheroes, especially, is what grabs your attention; it’s the artist’s job to convey that. Then the writer steps in and uses that moment to communicate their emotional and mental strength as well. These three traits complement one another. I wondered if a novel could properly re-create that power. Since so much of a superhero’s identity is rooted in action and visuals — perhaps even more than words — would these characters even translate well into novel protagonists? Or would She-Hulk and Rogue become shallow versions of themselves? The answer is different than what I expected — at least in She-Hulk’s case (I have yet to get around to Rogue). 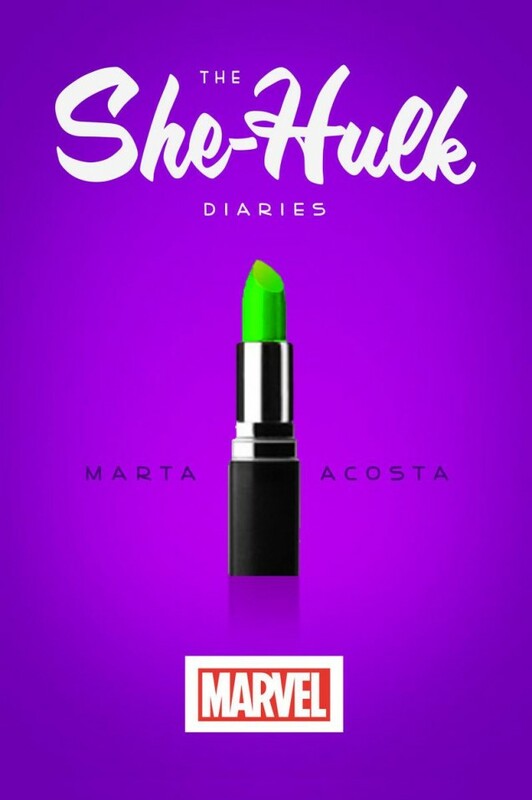 After reading Marta Acosta’s fun and very juicy The She-Hulk Diaries (out today), I decided that a) yes, superheroes have enough thoughts buzzing around in their heads to fill a novel but b) the whole superhero action thing is what comes across poorly. Acosta takes She-Hulk, aka Jennifer Walters (although, in this book, they’re two separate characters who cohabit the same body) and makes her a character worth knowing outside of comic books. I’m a nerd and stickler for accuracy and faithful portrayals, but she pulls it off. But as someone who doesn’t write for comics, Acosta loses stride when delivering big action. She restricts most of She-Hulk’s crime-fighting efforts to trashing petty thugs who are also cartoonish — and not in a good way. In a cheesy, ’60s comics kind of way. It half works with the story. The Avengers have ostracized She-Hulk, and she’s not getting all the cool, intergalactic gigs anymore. So she’s stuck picking loser bad guys off the streets. However, the whole time, I was waiting for at least one super-villain showdown. Acosta does include one — sort of. To leave one out would have disappointed a lot of readers, but what she ends up with isn’t handled with the same finesse and drama as what you’d see in comics today. It’s a little outdated and campy. I found this to be the weakest part of the book. I’m reluctant to put a label on The She-Hulk Diaries, but this very much does seem like chick-lit to me. (Marta can fight me in the comments if she’d like.) But that’s good news because I find chick-lit to be very fun, and hey — it’s definitely not romance. What’s most impressive is how Acosta writes Jen/She-Hulk in a way that would make any modern, feminist-minded woman proud. Jennifer stands up for herself. She doesn’t jump into a relationship (or bed) although she courts some very different suitors. She doesn’t have the best history with men, either. She’s normal, but at the same time, she’s a little wiser than some of us. She isn’t a flawless character, though. Pretty much anywhere outside the courtroom (Jen’s a lawyer), she struggles with self-confidence. She’s got some anger issues, deep down. But I love her for being honest and so dedicated to her work, which is all about doing good. I love her for treating her friends with just as much importance and care as her career — and while finding a relationship is important, she doesn’t degrade herself to get there. She’s not going to change who she is. To say that’s an important message for young women and girls today would be an understatement. By the end, I wanted more of Acosta’s writing because it was so enjoyable, but she does leave readers hanging about a few minor plot threads: the circumstances surrounding She-Hulk’s split from the Avengers, for example, and how Jen feels about her mother’s death. At the same time, the overarching story — which connects the “antagonists” (I’m lumping them in a very general group) together and keeps She-Hulk (and lawyer Jen) rather busy — isn’t as compelling as the little details: the everyday thoughts and actions of these two characters. The book pours on the romance more heavily later on, when Jen has to choose between several love interests. And I can’t help but feel like her union with Mr. Right was a little mushy. Complaints aside, The She-Hulk Diaries is a light, funny, and emotionally cathartic read that breaks expectations. Read my interview with Marta Acosta for more. Thanks to the author for the advance reader’s copy. I’ll be reviewing Rogue Touch soon as well. I’ve never heard of this but I might pick it up, sounds like my bag. I’m interested in superhero prose stuff a lot more recently after reading The Girl Who Would Be King. Have you come across it? It sounds like it’d be up your alley.